gold stacking birthstones beauties symbolic of each of their three little ones. 18kt yellow gold, aquamarine, garnet, and sapphire with a matte, hammered texture. these were made for a special celebrating years of marriage. 14kt white gold palladium engagement ring with a coiled style and accented with a tiny red coral cabochon. i really loved making this ring. 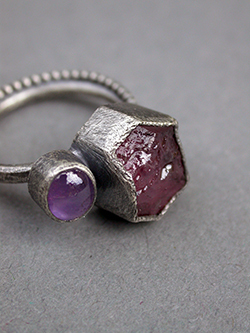 it was a special order commission piece designed after a ring made out of an antenna. the gal had dreamed her guy had proposed with a ring he had made out of an antenna. sooooo, he did!!! :) he later contacted me with pictures to do a very similar version in white gold palladium with a red coral accent :)))) such a fun project and beautiful story. the bottom band (engagement ring) has a 8mm prasiolite and a tiny asymmentrically set diamond. The top "contour" style (wedding ring) is set with a 3mm emerald. I'm so happy to have made these rings. I love my job!! 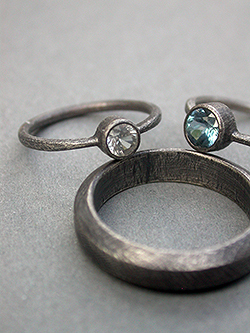 "asymmetrical border wedding rings" in oxidized sterling. best wishes to you guys, Alicia & Fred!!!! 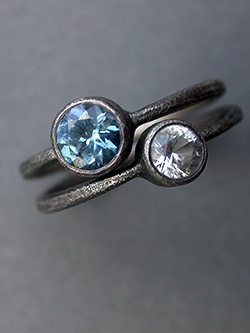 raw and faceted apatite engagement ring in oxidized sterling. this one is killer and my super fave!! i love it so frickin' much. engagement & wedding ring set for a very lucky her!!! this one was pretty hard to part with. rose cuts of this scale are stunning!!!!! 2ct half ballas raw black diamond engagement ring. made with 14kt palladium white gold with a hammered matte surface.